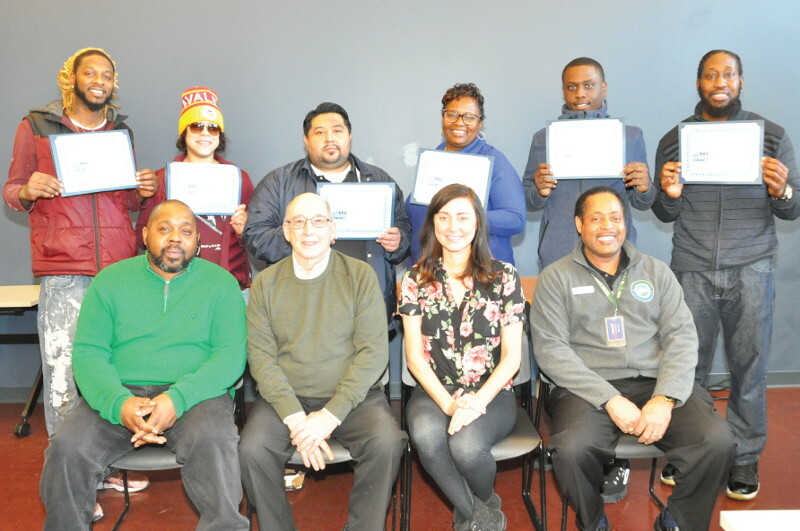 On Friday, January 4, 2019, WRTP/BIG STEP, in partnership with Employ Milwaukee and Leonardo DRS, presented the graduates for the ELMS-Electrical Assembly Apprenticeship Readiness Training program, at their facility, 3841 West Wisconsin Ave.
WRTP/BIG STEP’s registered apprenticeships offer opportunities to earn a salary while learning the skills necessary to succeed in high-demand careers. Not only does WRTP/ BIG STEP work with industry leaders to create more of these opportunities, WRTP/BIG STEP helps individuals reach out and achieve them. Pictured at the completion ceremony are (back row, from left) Kertis Owens; Sekina Patterson; Abdi Contreras; Novia Parish; Jaquan Dotstry; Alameen Amir; (front, row from left) WRTP/ BIG STEP Manufacturing Program Coordinator Otis Dunning; WRTP/BIG STEP Manufacturing Industry Coordinator Joseph Nicosia; WRTP/BIG STEP Talent Acquisition Manager Krista Szallai; and Emplopy Milwaukee President and CEO Willie C. Wade.